1. Revell have released their 1:72 EC135 VIP, #4475. 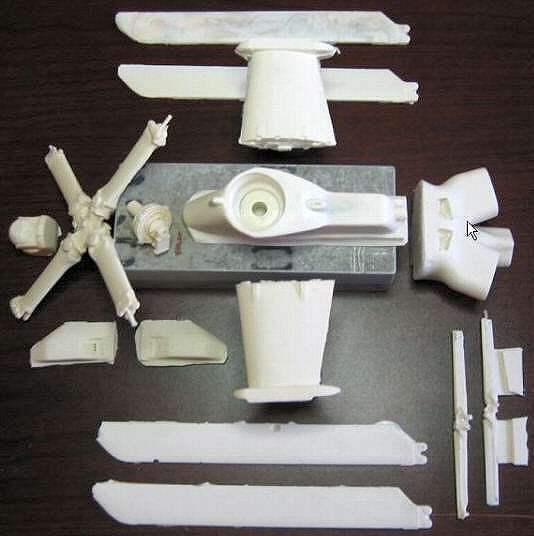 The parts are the same as for their ADAC / OAMTC version (HKN #135), but moulded in white. Decals are provided for VH-GKK, and a Eurocopter demonstrator seen at the Paris Salon, Le Bourget in 2001. 2. Test shots of the new Revell EC145 have been posted at the DPMV (Deutscher Plastik-Modellbau-Verband, select 'I-Punkt' on the menu). We still don't know what the decal sheet is going to look like, but the catalogue shows the colourful Eurocopter demonstrator D-HMBM. 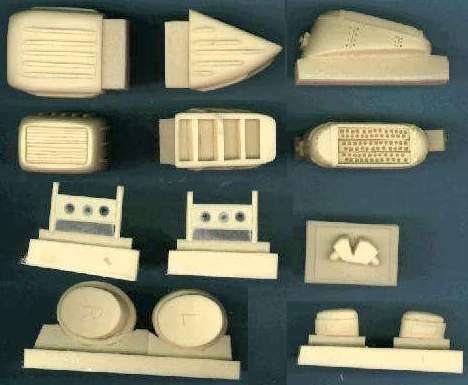 We can only guess whether these will be new moulds or re-boxes, although some kind of licencing from Italeri and Zvezda seems most likely. 4. 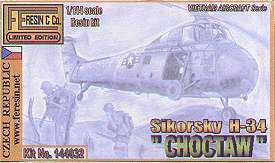 The latest in the line of 1:144 kits from FE Resins is #14432, an H-34 'Choctaw'. Decals are provided for machines from the USMC and JMSDF. 6. Due from Anigrand in Apr-05 is a 1:72 kit of the Sikorsky S-57 (XV-2) single blade rotor VTOL concept aircraft. This was a proposed joint US Army/USAF development program for a radial engine powered convertiplane which featured a rotor used for take-off and landing that folded away and stored in the fuselage during level flight. Bu.No. 54-4403 was assigned to the prototype but it was cancelled before it was built. 7. First deliveries of a new kit of the Kamov Ka-60 from Zvezda, #7245, are expected in about two weeks. 8. Williams Bros. have recently ceased production and are closing down due to illness, so if you want to get hold of their Pitcairn Autogyro in either 1:48 or 1:87 (HO) scale, now would be a good time. #35013, USMC Weapons set for the 1:35 Panda UH-1N, including mounts, rocket pods, minigun and .50 cal machine gun plus ammo cans and flex chute. #35014, Mi-24 exterior upgrade for the 1:35 Trumpeter Hind, including exhaust suppressors, chaff/flare dispensers, RHAW sensors, etc. 10. Part have released 1:35 brass detail sets (S35021 Mi-17 and S35017 Mi-24V) for the Trumpeter Mi-8 and Mi-24 kits. Each comprises two sheets of brass plus an ecetate film instrument panel. #C-010 is an External Detail and weapon set for the Mi-24D Hind-D. It has 30 resin and 115 brass parts including all weapons variants, internal fuel tank, engine intake dust separators PZU, chaff/flare dispensers ASO-2V, correct infrared jammer, and surface details and antennas. #C-011 (shown above) is similar, but for the Mi-24V Hind-E. This one has 33 resin and 57 brass parts for making all weapons variants, external fuel tanks, exhaust cooling system, engine intake dust separators PZU, chaff/flare dispensers ASO-2V, RWR L-006 Berjozka antennas, correct infrared jammer, taxi light, and surface details and antennas. 12. Charles Butler (an aerospace designer/engineer at Bell Helicopter) has made a complete resin set to convert the 1:35 Academy/ MRC / Italeri AH-1W SuperCobra into the latest version of the next-generation AW-1Z. The set includes: new crown & power unit housing, new turned out exhaust stacks, four bladed yoke, four main and 2 rear rotor blades, left and right side chaff flare dispensor housings, new target acquistion 'pod'--15 large resin pieces. Auxiliary fuel tanks, rocket pods, and other details are available upon request. Charles freely states that all parts will need some smoothing and general surface preparation, but this is a unique opportunity to obtain these conversion parts. Email Charles for more details. The UH-1Y will be next for this treatment. 13. Tish Swiecicki is intending to make available a set of vacform body panels and bubble canopy to convert the 1:35 Revell or MRC Bell 47s into a 47J. A model demonstrating the result is under Tish's name in the HKN Gallery. If you are likely to be interested, please contact Tish so that he can estimate how many sets he might produce. 14. Linden Hill 'Bush War Hinds part 2' is now released. Sheets #48012 and 72012 cover the 18 schemes detailed in HKN #193, while #35002 covers 11 of them. Full details and pictures are at the Linden Hill website. 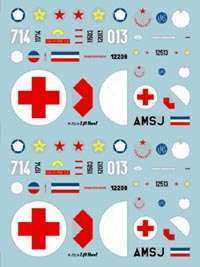 Also available now are the sheets of Mi-24 airframe stencil data to go with them. 15. 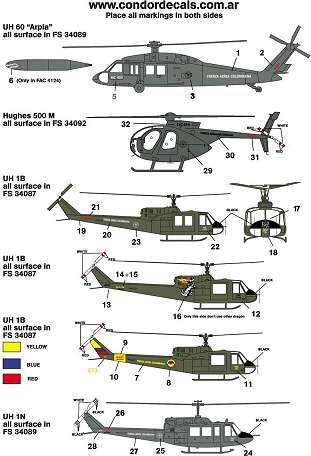 Condor Decals from Argentina have issued a 1:72 sheet entitled 'Columbian Attack Helicopters', #72-024. 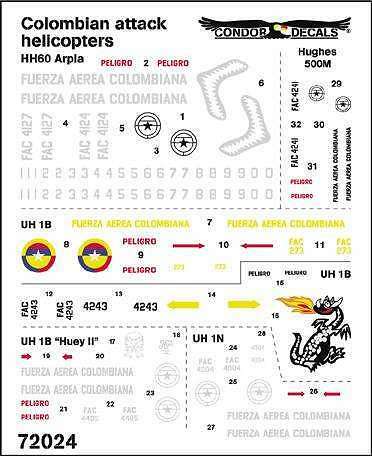 The sheet has markings for Fuerza Aerea Columbiana UH-60 'Arpia'; Hughes 500M, UH-1N, and three UH-1B, one low visibility, one with 'Dragon' artwork, and one with high-visibility yellow titles, FAC roundel, and red, blue and yellow tail. 16. Red Bolt have now completed a set of 1:72 decals for the three Swedish Police EC135s, each of which is different in marking details. There could be a lot of extra work for the modeller because there are a lot of differences between the Swedish aircraft and the Revell kits. The decals were originally produced to a custom order in 1:32 (see the model by Hans Percy in the HKN Gallery), so they may be available in the larger scale as well. A resin conversion for the Swedish Police EC135 is in preparation, comprising up to 20 separate parts, but there are no promises for when this may be ready. 17. Two new sheets from Lift Here! cover aircraft in the Museum Of Yugoslav Aviation near Belgrade. 18. Samples of the latest releases from JBOT (see also HKN #193) show that the NYPD Bell 412 sheet also includes markings for the Jetranger N206NY. Remember that JBOT decals are printed to order in any scale you wish (within reason!). You just have to ask. 19. Zotz Decals, famous for their coverage of aircraft featuring colourful artwork, will be covering Latin American Hinds from Cuba, Peru, and Nicaragua, in three scales (#72013, 48013, and 32006). We expect there will be plenty of shark's mouths on display. EC135 No. 256 as used by the Irish Police but flown by Air Corps pilots. Although primarily 1:48, Max4816 will include 1:32 scale decals for the same EC135 mentioned above, plus 1:48 markings for the IAC Dauphin (Trumpeter kit, or for the Fonderie Miniature kit of the Panther if it is ever released. The Antarctic Helicopters sheet is still underway and some of the artwork should be ready for viewing at Scale Modelworld 2004. 21. RAFDec are looking into the possibilities of new sheets for the Belvedere and the Sycamore, if enough good RAF schemes can be documented. So if you have any good photos that you'd like to share, please contact them directly. Thanks to Gertjan Zwart, Colin Burgess, Harold Stockton, Pawel Okulski, Chris Miller (Cobra Co.), Fabian Vera (Condor), Anders Nowotny (Red Bolt), Joe Maxwell (Max), and Jim Botaitis (JBOT).